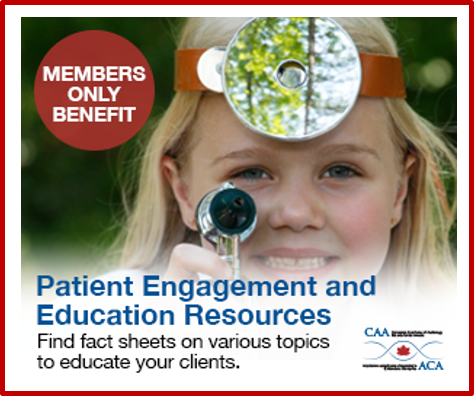 CAA assists in developing professional guidelines and responds to proposed regulations and policies, providing a unified perspective on issues related to hearing health care. This is an update on the advocacy activities of the Canadian Academy of Audiology as a member of Hearing Health Alliance of Canada as of April 8, 2019. Two years ago, a small group of organizations began discussions on forming a National Alliance to raise awareness of the impact of unmanaged hearing loss, the need for prevention of hearing loss and the urgency to act towards building a national strategy for hearing health. A second group of organizations began similar work in June of last year. Both groups joined together to continue the work of a Hearing Health Alliance of Canada. The governance of the Alliance is founded on the principle that many professions, consumers, fund raisers, researchers and companies have roles in ensuring a healthy and vibrant hearing health system in Canada. All these organizations have one major objective in common: to raise awareness and to address solutions to our failing hearing health care system in Canada. The Hearing Health Alliance of Canada (HHAC) is a collaborative partnership between the Hearing Instrument Practitioners of Ontario, the Canadian Academy of Audiology, the Canadian Hard of Hearing Association, the Canadian Hearing Instrument Practitioners Society, Cochlear Canada Inc., The Hearing Foundation of Canada and the Hearing Industry Association of Canada. Find out more about ongoing advocacies. Working alongside like-minded organizations, CAA plays an integral role in producing and maintaining practice and protocol guidelines that advance and protect the profession. In 2009, CAA, as part of the Canadian Interorganizational Steering Group for Audiology and Speech-Language Pathology, helped to develop and distribute Infection Prevention and Control Guidelines. In 2010, the team undertook the development of guidelines for the assessment and management of auditory processing disorders in children and adults. CAA collaborates with many organizations and associations to initiate reforms in the profession. CAA’s Disability Tax Credit (DTC) Committee has also been established to advocate change to the wording contained in the eligibility criteria under the DTC as it applies to individuals who are hard of hearing. CAA has been working closely with CHHA, providing audiological expertise and support around matters related to the DTC. As part of the Concerned About Classrooms Coalition, CAA is helping to enhance the learning environment of millions of children and the vocal health of Canadian teachers. CAA members are asked to express their issues or concerns so that CAA may continue the dialogue with its partners in hearing healthcare services. Become a CAA Board Member! Our Mission: The Canadian Academy of Audiology (CAA) is dedicated to enhancing the role of audiologists as primary hearing health care providers through advocacy, education and research. CAA is looking for a strong advocate like you to become involved in providing leadership to our profession. We are looking for individuals with a strong sense of determination, energy and enthusiasm to become active in the continued success of our organization. The Board of Directors is comprised of audiologists with a broad range of skills, specialities and professional experience from across Canada. What are we looking for in a Board Member? A desire to make things happen! What does CAA need from Board Members? Positions are for a three-year term starting October 2019. There is an in-person meeting once per year at the CAA Conference and Exhibition and teleconference meetings throughout the year. All Board Members are volunteers and are expected to participate in project activities of the Board and its committees. Download the CAA Board Nomination Form 2019 and return to Board@canadianaudiology.ca by the deadline below. Please attach the candidate’s resume and be sure they tell us why they want to become a Board Member. CAA will also accept self-nominations for Board positions. If you have further questions, please contact us at Board@canadianaudiology.ca for more information. It is our pleasure to officially announce the formation of Hearing Health Alliance of Canada demanding urgent action by the Federal Government towards a National Hearing Health Strategy. Two years ago, a small group of organizations began discussions on forming a National Alliance to raise awareness of the impact of unmanaged hearing loss, the need for prevention of hearing loss and the urgency to act towards building a national strategy for hearing health. A second group of organizations began similar work in June of last year. Both groups joined together to continue the work of a Hearing Health Alliance of Canada. We encourage members and associates to share these resources with their colleagues, other health professionals, policy-makers and community leaders to raise awareness and advocate for comprehensive EHDI programs across Canada. Read the 2019 EHDI Report Card, and see the Press Conference. 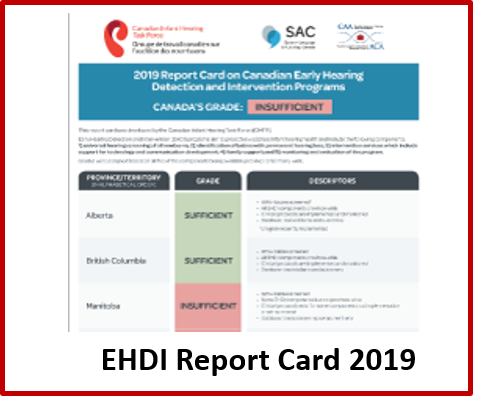 The Canadian Infant Hearing Task Force, a joint effort of the Canadian Academy of Audiology and Speech-Language & Audiology Canada, is a national group of leaders and experts in matters related to early hearing detection and intervention (EHDI). The task force was formed to promote, support and advocate for comprehensive universal EHDI programs in all Canadian provinces and territories. To learn more, please visit: InfantHearingCanada.ca. To get Bill C-81 passed before the government calls an election, we need your help. If we don’t get this bill passed, it will truly be years before we are in this position again. Some may say that a flawed bill is worse than no bill. Nope. We’re not buying that. Bill C-81 is a good bill. It deserves to be enacted into law. We know this, because the Leadership Team of FALA were the organizations that did the consultations prior to the bill being created. And you know what? Lots of what we – the disability community – asked for is in this bill. Ya, it can be better – and that’s why we have our 11 recommendations. But we got nada if we don’t get it passed. We will have lost years of work. So, rally cry… Let’s Do This. We’ve created a new section in our online toolkit called: Working with the Media. In it you can find a Guide to Generating Positive Media Coverage, Questions and Answers about Bill C-81, and Key Messages. Please use these resources to contact your own media outlets and tell them why you want Bill C-81 passed. Feel free to take parts of our media release and use them as your own. Use your own quotations, your own examples and BOOM – you have a fab media release to send out to your community media. We have also written a letter that can be passed around via social media. You (and everyone you know) can sign it and the letter will be sent to all the Senators, Minister Qualtrough, Prime Minister Trudeau, and the MP of your riding. You can find the letter here: https://www.include-me.ca/pass-bill-c-81. Please start sharing now. This is it. It is time to own this Bill C-81. We are 90 organizations strong as well as 91 additional individual members. Together, we can move this bill through and get ourselves a historic Accessible Canada Act. Pour faire adopter le projet de loi C-81 avant que le gouvernement déclenche des élections, nous avons besoin de votre aide. Si nous ne faisons pas adopter ce projet de loi, il nous faudra des années avant que nous retrouvions cette position. Certains diront peut-être qu’un projet de loi imparfait est pire qu’aucun projet de loi. Nous ne le croyons pas. Le projet de loi C-81 est un bon projet de loi. Cela mérite d’être ordonné. Nous le savons, car l’équipe dirigeante d’ALFA était celle qui avait mené les consultations avant la création du projet de loi. Et savez quoi ? Beaucoup de ce que nous – la communauté des personnes handicapées – avons demandé est dans ce projet de loi. Ouais, ça pourrait être mieux – et c’est pourquoi nous avons nos 11 recommandations. Mais nous avons zéro si nous ne le faisons pas passer. Nous aurons perdu des années de travail. Nous avons créé une nouvelle section dans notre boîte à outils en ligne intitulée : Travailler avec les médias. Vous y trouverez un guide pour générer une couverture médiatique positive, des questions et des réponses sur le projet de loi C-81 et des faits saillants. Veuillez utiliser ces ressources pour contacter vos propres médias et leur dire pourquoi vous souhaitez que le projet de loi C-81 soit adopté. N’hésitez pas à prendre certaines parties de notre communiqué de presse et à les utiliser comme les vôtres. Utilisez vos propres citations, vos propres exemples et VOILA – vous avez un fabuleux communiqué de presse à envoyer à vos médias quotidiens. Nous avons également écrit une lettre qui peut être transmise via les médias sociaux. Vous (et tous ceux que vous connaissez) pouvez signer et la lettre sera envoyée à tous les sénateurs, à la ministre Qualtrough, au premier ministre Trudeau et au député de votre région. Vous pouvez trouver la lettre ici: https://www.include-me.ca/pass-bill-c-81. S’il vous plaît commencer à partager maintenant. Ça y est. Il est temps d’accepter ce projet de loi C-81. Nous comptons 90 organisations et 91 membres individuels supplémentaires. Ensemble, nous pouvons faire adopter ce projet de loi et obtenir une loi historique pour un Canada accessible. 12 February 2019 ¦ GENEVA: Nearly 50% of people aged 12-35 years – or 1.1 billion young people – are at risk of hearing loss due to prolonged and excessive exposure to loud sounds, including music they listen to through personal audio devices. Ahead of World Hearing Day (3 March), the World Health Organization (WHO) and the International Telecommunication Union (ITU) have issued a new international standard for the manufacture and use of these devices, which include smartphones and audio players, to make them safer for listening.